Photograph by Roger Stalley. 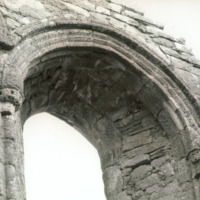 Detail of lancet window showing foliate and lattice capitals with roll - and - fillet moulding and hood moulding with foliate label stop. Photograph by Roger Stalley. 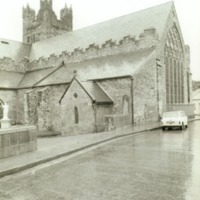 View of crossing tower and south transept showing Decorated Gothic windows with geometric tracery and open tracery squinch. Photograph by Roger Stalley. 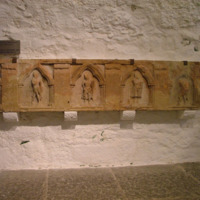 View of south wall of the south transept. 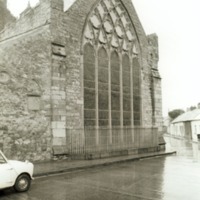 Decorated Gothic south window, with cusped intersecting tracery. Photograph by Roger Stalley. 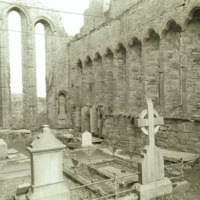 SW view of crossing tower, transept, south elevation showing buttresses and Early Decorated window with geometric tracery. Photograph by Roger Stalley. 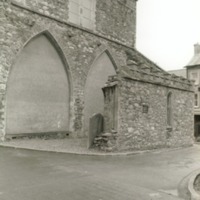 View showing remains of Chapter House, located to south of south transept. Photograph by Roger Stalley. 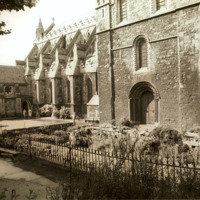 Exterior view showing Chapter House remains to south of south transept, and showing entrance into south transept. Photograph by Roger Stalley. 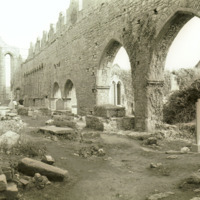 Exterior view, looking west, of south elevation, showing south porch, nave, elevation of south transept, and remains of Chapter House in the foreground. Photograph by Roger Stalley. 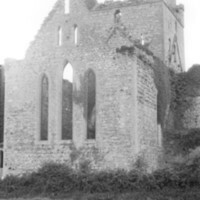 View from north - east showing crossing tower and east end presbytery which has triple lancet windows with paired lancets overhead and a round - headed window at the apex of the gable. Photograph by Roger Stalley. 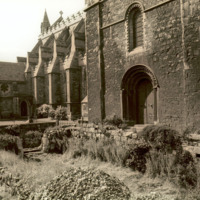 View of from north - east showing crossing tower, north transept and east end presbytery which has triple lancet windows with paired lancets overhead and a round - headed arch at the apex of the gable. Photograph by Roger Stalley. 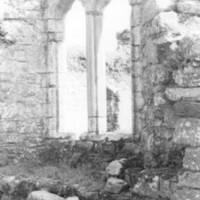 View from west through crossing to east end presbytery showing triple lancet windows and paired lancets overhead. 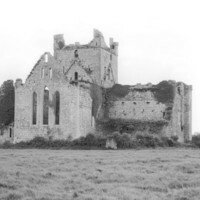 North elevation of nave shows first arcade bay and clerestory windows located over the piers, as is common in Irish Cistercian houses. Photograph by Roger Stalley. 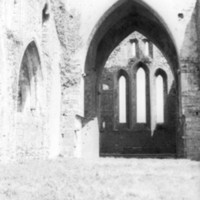 View of north elevation of nave showing (blocked) fifth bay of nave arcade with roll - and - fillet arch mouldings. Photograph by Roger Stalley. 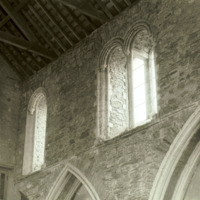 View of paired trefoil - headed windows with roll - and - fillet cusped arch mouldings and filleted shafts. Photograph by Roger Stalley. 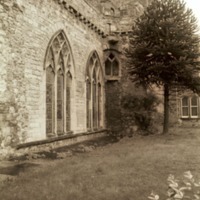 View of north elevation of west end of nave showing roofless north aisle with single round - headed window, blocked up pointed arches of nave arcade, stringcourse and clerestory with paired round - headed windows. Photograph by Roger Stalley. 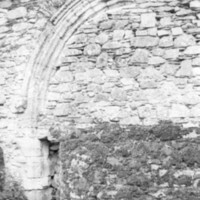 View of arched recess (blocked nave arcade?) 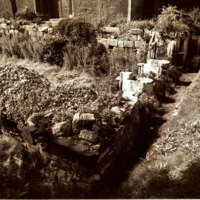 containing tomb effigy, memorial plaque and tomb slab. 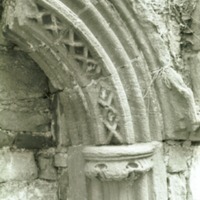 Arch has roll - and - fillet moulding and scroll carved label stop. Photograph by Roger Stalley. 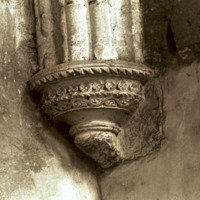 View of corbel with nailhead, stiff - leaf foliage, cable moulding and foliate ornamentation. Photograph by Roger Stalley. 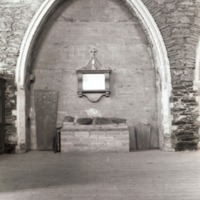 View showing clerestory above a stringcourse with one set of paired round - headed windows and single round - headed window with the apex of two pointed arches below.